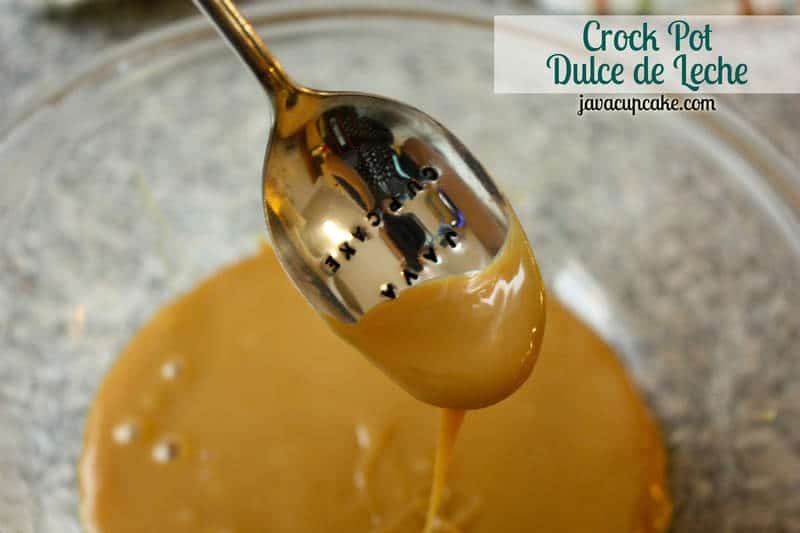 This rich, thick, delicious and easy Crock-Pot Dulce de Leche makes the best filling for cakes, cupcakes or even topped on ice cream! This week my friend Jason of Coffee Cup News asked if I’d be interested in submitting coffee related recipes to his blog every month or so! And well… since I love Jason’s blog (I’ve been a loyal following since the beginning) I jumped at the chance to contribute! Jason wanted original content for his blog… which well uhm… .might be hard cause I use coffee a lot in my baking. I mean, every chocolate cupcake I make has coffee in it. I’ve even already made a cupcake with coffee in the cake AND the frosting… my Mocha Mocha Cupcakes. And really… what kind of a blogger would I be if I called myself “JAVA” Cupcake and never used coffee! So… I’m on a quest to come up with a new coffee cupcake for my first post on Coffee Cup News. When I first began brainstorming ideas, I thought about some of my favorite coffee drinks I like to get when I go to Starbucks. Let me be more specific…. when I go to Starbucks in the USA. European Starbucks offer completely different flavors and I just haven’t jumped on that bandwagon yet. Yeah – I’m a Seattle Starbucks Snob. lol One of my favorites at Starbucks is anything with caramel in it. Caramel Macchiato, Caramel Frappucino, Caramel Mocha… seriously, anything with caramel in it is YUM. And then that got me to thinking about how I could incorporate caramel into a cupcake, uniquely. Dulce de leche! PERFECT! I’ve never made it before and I’ve read on so many other blogs how simple it is to make. So yes…. 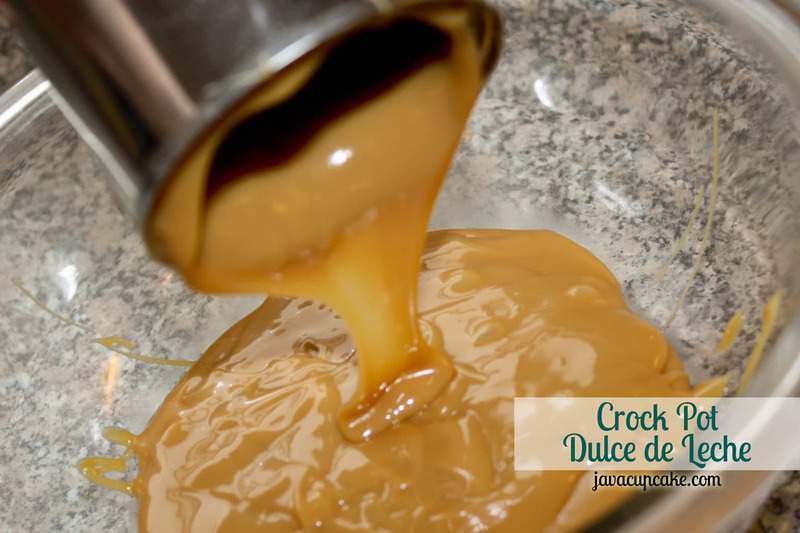 I’ll make dulce de leche and fill my cupcakes with it and then of course drizzle it on top! And let me tell you… there is nothing simpler than making this sweet, caramely goodness. You need only three things and time. Simple. Easy. Delicious. Remove the paper from the can of milk. Plate a piece of foil or a heat proof plate on the bottom of the crockpot to protect it from rust building up on the can during cooking. Set the can of milk on the plate or foil and cover completely with water then attach crockpot lid. On HIGH: Cook for 4-6 hours. 5 hours seems to make a good consistency, but go 6 if you want it thicker. On LOW: Cook 8 hours. CAUTION: Make sure that the can remains covered AT ALL TIMES. Allowing the water to boil off could cause the can to explode. Allow can to come to room temperature before opening. Store in air tight container up to a week in the refrigerator. This is one of my FAVORITE things EVER!!! I started doing this way back when I was on extern during my CIA days. 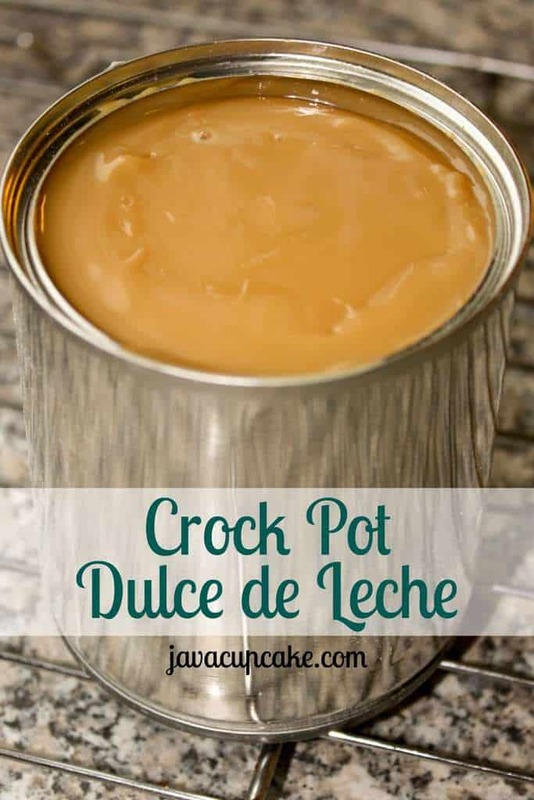 I added it to a rice pudding recipe, and I was never the same! It is amazing the way it changes just by cooking in the can! It’s my first time making it… I don’t know why I waited so long!!! AMAZING! oh WOW!! That is practically abstinence!! I’m so glad you finally did it! I could eat it straight from the can like this. Enjoy! Do you remove the top of the can? or leave it as is once the paper wrapper is taken off? How high should the water go over the top of the can so that it doesn’t boil off enough to expose the can in that 8hr time period? Leave the lid on the can until it has cooked and completely cooled. Also, you want to completely submerge the can in water. Check back often to make sure the water hasn’t boiled off. If you need to add more, make sure to add very hot water! Good luck! Can you do multiple jars at once?? I am thinking of making for showere favors, do they have to be refrigerated, and how long can they last???? Yes, I suppose you could… just don’t overcrowd your crock pot! How long will they last, and do they need to be refrigerated.?…. I generally put how ever many cans will fit in my crock pot, but instead of completely submerging them, I poke 2 vent holes in each can and fill water almost to top of cans. Eliminates the possibility of explosions and turns out just as well. a little bit might squeeze out or a bit of water may get on top of the cans, but that pours right. I make this every year as gifts and it’s a big hit! “but that pours right off, I meant!